Hunger Quiz: How many people are very food insecure in the United States? The estimated percentage of U.S households that were food insecure in 2016 was 12.3%. Though relatively unchanged from 12.7% in 2015, food insecurity has decreased from 14.9% in 2011. However, it is still above the estimated percentage of food insecurity of 11.1%, which existed pre-recession (2008) in U.S. households (Coleman-Jensen, Rabbitt, Gregory, Singh, 2017). In 2016, 87.7 % of U.S. households were food secure throughout the year. In 2016, 12.3% of U.S. households (15.6 million households) were food insecure. Food insecure households are those where people had difficulty providing food to all members of the household due to limited resources. 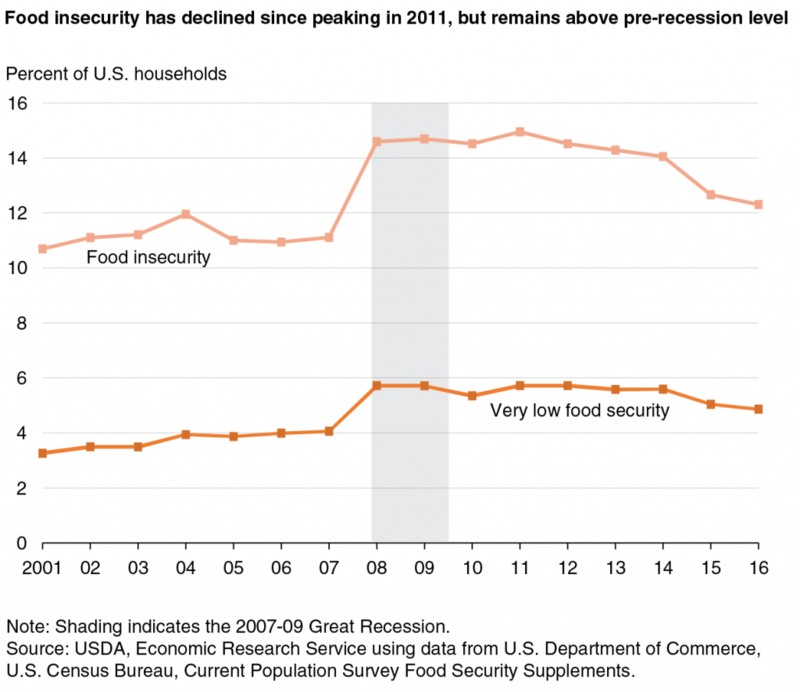 4.9% of U.S. households (6.1 million households) had very low food security. In households with very low food security, food intake is decreased, and normal eating patterns are disturbed for some members of the household at times during the year. 8% of U.S. households with children (3.1 million households) were food insecure. These households were unable to provide adequate nutritious food for their children at some point during the year. In 0.8% of households, both adults and children experienced very low food security. 298,000 households with children experienced very low food insecurity in 2016. Food insecurity in households with children headed by a single parent, or households with single women or single men living alone, or households with a Black or Hispanic head of family, or households in principal cities and non-metropolitan areas is higher than the national average for households with incomes near or below the federal poverty limit. The prevalence of food insecurity varies from state to state, ranging from 8.7% in Hawaii to 18.7% in Mississippi in 2014-2016. Based on data from 2016, the 10 hungriest states in the U.S. are Mississippi, Arkansas, Louisiana, Alabama, Kentucky, Ohio, Oregon, North Carolina, Maine, and Oklahoma. The average food-secure households spent 29% more for food than the average food-insecure household of the same size and composition. The estimates include food purchases made with Supplemental Nutrition Assistance Program (SNAP), formerly known as food stamps, benefits. About 59% of food-insecure households in the survey reported that in the previous month they had participated in one or more of the three largest federal nutrition assistance programs: SNAP, Special Supplemental Nutrition Program for Women, Infants, and Children (WIC), and/or the National School Lunch Program. Note: In 2006, the U.S. Government eliminated references to hunger in their definitions, but kept various categories of food insecurity. This did not result in any changes in what was measured. Very low food security (described prior to 2006 as “food insecurity with hunger”) means that at times throughout the year, the food intake of household members was reduced and their normal eating patterns were disrupted due to lack of money and other resources. This means that those experiencing very low food security experienced hunger–“the uneasy or painful sensation caused by want of food” (Oxford English Dictionary, 1971). For days each year, these households had to skip meals or eat smaller than typical amounts of food due to lack of funds and resources. Food deserts are defined as parts of the country with an unavailability of fresh fruits, vegetables, and other healthy whole foods (USDA). These areas generally lack grocery stores, farmers markets, and other healthy food providers. 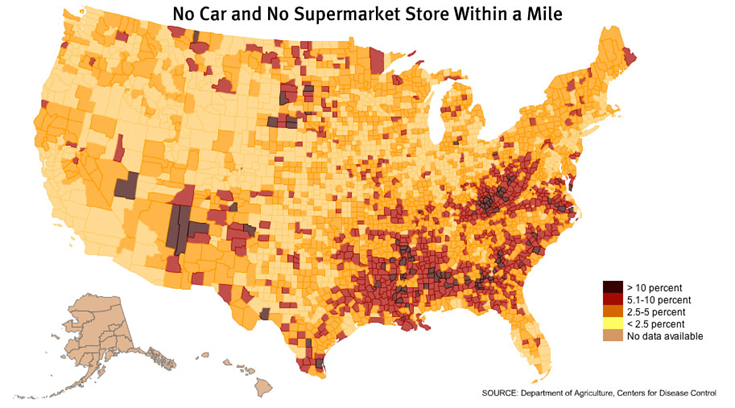 Households in rural and low-income areas are often sites for food deserts, as these areas lack large retail food markets. These areas might have convenience stores, but they rarely carry healthy foods. The official poverty rate was 12.7% in 2016, down 0.8 percentage points from 13.5% in 2015. This is the second consecutive annual decline in poverty. Since 2014, the poverty rate has fallen 2.1 percentage points from 14.8 % to 12.7%. There were 40.6 million people in poverty in 2016, 2.5 million fewer than in 2015 and 6 million fewer than in 2014. The poverty rate in 2016 (12.7%) was not significantly higher than the poverty rate in 2007 (12.5%), the year before the most recent recession. For most demographic groups, the number of people in poverty decreased from 2015. Adults aged 65 and older were the only population group to experience an increase in the number of people in poverty. Between 2015 and 2016, the poverty rate for children under age 18 declined from 19.7% to 18%. The poverty rate for adults aged 18-64 declined from 12.4% to 11.6%. 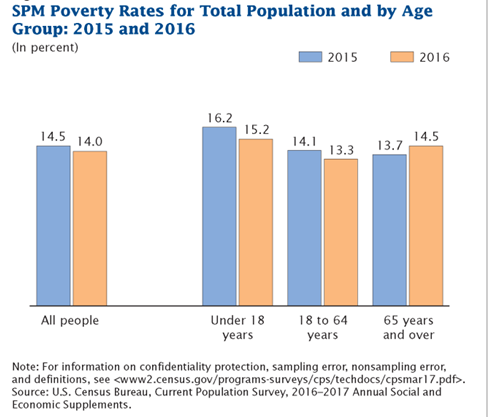 The poverty rate for adults aged 65 and older was 9.3% in 2016, higher but not statistically different from the rate in 2015. The supplemental poverty measure (SPM) was coined by the U.S. Census Bureau in 2011. It is the official poverty measure which takes into account the many government programs designed to help low income families and individuals. These programs are not included in the official poverty measure (Fox, 2017). The overall SPM rate was 14% in 2016. It was slightly lower than the 14.5% rate in 2015. SPM rates were down for children under age 18 and adults aged 18 to 64. SPM rates for individuals aged 65 and older went up, from 13.7% in 2015 to 14.5% in 2016. The SPM rate for 2016 was 1.3 percentage points higher than the official poverty rate of 12.7%. Social Security continued to be the most important anti-poverty program, moving 26.1 million individuals out of poverty. Refundable tax credits moved 8.1 million people out of poverty, representing an important safety net for many people. Taking account of other non-cash benefits also lowered poverty rates. For example, SNAP benefits lowered the overall poverty rate by 1.4 percentage points or 4.6 million people (Renwick and Fox, 2016). Two thirds of SNAP participants were children, elderly, or had disabilities. On a typical school day, around two-thirds of the total children receive free or reduced price lunches. Any child at a participating school may purchase a meal through the National School Lunch Program. Household income determines if a child is eligible to receive free or reduced price meals, or must pay most of the cost. To receive free lunch, household income must be at or below 130% of the federal poverty level; for reduced price lunch, income must be between 130-185% of the poverty level. The EITC is the mechanism through which, by filing a tax return, low-income people and families can receive an income supplement. It reduces poverty directly by supplementing the earnings of low-wage workers, and is designed to encourage and reward work. Feeding America is an extensive network of more than 200 food banks nationwide, serving 37 million including children and seniors through local partnerships such a soup kitchens, food pantries, after school programs and emergency shelters. The Meals on Wheels Association of America is a community based program, which provides approximately 1 million meals a day to seniors across the country, either by direct delivery to homebound seniors and adults with disabilities or congregational meals at community centers or long-term care facility centers. Center on Budget and Policy Priorities (CBPP). (2016). Policy Basics: Introduction to the Earned Income Tax Credit. Retrieved from http://www.cbpp.org/cms/index.cfm?fa=view&id=2505 Accessed September 18, 2016. Food and Research Action Center. Retrieved from http://frac.org/programs/national-school-lunch-program Accessed September 5, 2018. Lauffer, Sarah. (2017). Characteristics of USDA Supplemental Nutrition Assistance Program Households: Fiscal Year 2016. Renwick, Trudy and Liana Fox. (2016). The Supplemental Poverty Measure: 2015. Retrieved from https://www.census.gov/content/dam/Census/library/publications/2016/demo/p60-258.pdf Accessed September 30, 2016. United States Department of Agriculture, Food and Nutrition Service. WIC Program. Retrieved from https://www.fns.usda.gov/wic/ Accessed September 5, 2018. Wikipedia. Earned Income Tax Credit. Retrieved from http://en.wikipedia.org/wiki/Earned_income_tax_credit Accessed September 30, 2016. Wikipedia. Factor price equalization. Retrieved from http://en.wikipedia.org/wiki/Factor_price_equalization Accessed September 30, 2016. Wikipedia. Minimum wage. Retrieved from http://en.wikipedia.org/wiki/Minimum_wage Accessed September 30, 2016. Wikipedia. Supplemental Nutrition Assistance Program. Retrieved from http://en.wikipedia.org/wiki/Supplemental_Nutrition_Assistance_Program Accessed September 30, 2016.